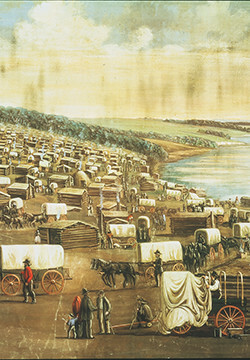 Joseph Smith arrived in Independence after traveling first by steamboat and then an additional 300 miles by stagecoach. Martindale v. Smith: Plaintiff by his attorney Hitchcock filed his declaration with Geauga Court of Common Pleas clerk D. D. Aiken. The declaration stated the indebtedness: $5,000 on October 11, 1836; $6,000 on February 20, 1837; $7,500 on April 25, 1837. Joseph Smith preached on the hill near the Nauvoo Temple concerning the building of the temple. Joseph Smith took his children on a pleasure ride in a carriage. God the Father and Jesus Christ appeared to the fourteen-year-old Joseph Smith in answer to his prayer. Joseph Smith received Doctrine and Covenants 10, a revelation about the designs of wicked men who had made alterations to the 116 lost manuscript pages. Parts of this revelation may have been received as early as summer 1828. Joseph Smith continued dictating the translation of the Book of Mormon to Oliver Cowdery. Reid v. Smith: Payment in case of charge of riot and treason by the state of Illinois.